Sometimes you find beautiful beads, buy them, and wait....until inspiration strikes:) Well, it struck this weekend. 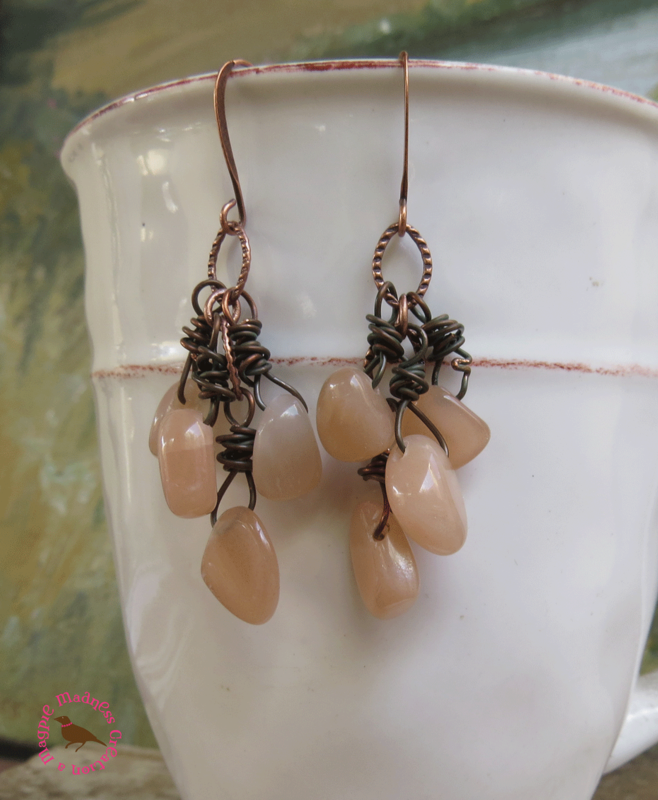 I wired these pale peach moonstone beads with hand antiqued copper wire to an antiqued copper chain. Voila! I'm getting ready for autumn attire, the browns, rustic oranges, and forest greens. This long dangle rustic cluster pendant necklace will be a wardrobe must have. Pantone's 2017 fall colors include Butterum, this similar shade of warm peachy brown. Necklace falls 30 inches to the pendant then 2.75" more. Cluster is composed of peachy moonstone beads and Swarovski crystals. Stunning. See necklace on my Etsy site here. See coordinating earrings here.